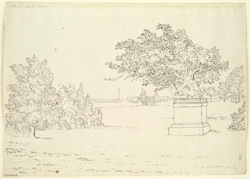 An outline view in ink of the pillar in Blenheim Park in Oxfordshire, taken from the Statue of a Slave in Blenheim Park. Daniel Defoe, who visited in 1720, reported of "gardens of 100 acres of ground" and huge offices and outbuildings on the estate. The grounds at Blenheim were changed considerably during the period 1764-74, when Capability Brown was employed here. Queen Anne granted the Royal Manor of Woodstock to John Churchill, the first Duke of Marlborough, in gratitude for his defeat over the forces of Louis XIV at Blindheim (Blenheim) on the Danube in Germany in 1704. At her own expense she created the extensive grounds and opulent palace, which to this day remains the home of the current Duke of Marlborough.